Going Home with Nelly After Five. Copyright. 1883 by Wm. A. Pond & Co.
Oh, Broadway is a thoroughfare for both the high and low. There side by side, just like the tide, it's up and down we go. It's laboring men and working girls, like bees out of a hive. Among the crowd I'm going home with Nelly after five. When I hear the whistle blow, then up Broadway I go. Oh, when I've done my daily toil, oh, with this working girl. Among the crowd contentedly with Nelly after five. Quite pretty, too, with eyes of blue, at every working boy. To take my place in going home with Nelly after five. - Chorus. Oh, merchants in the doorways there, and hackmen on the walk. Oh, young policemen now and then, they all turn round and talk. "Oh, there she goes!" "Ain't she a rose!" "I knew they would arrive!" 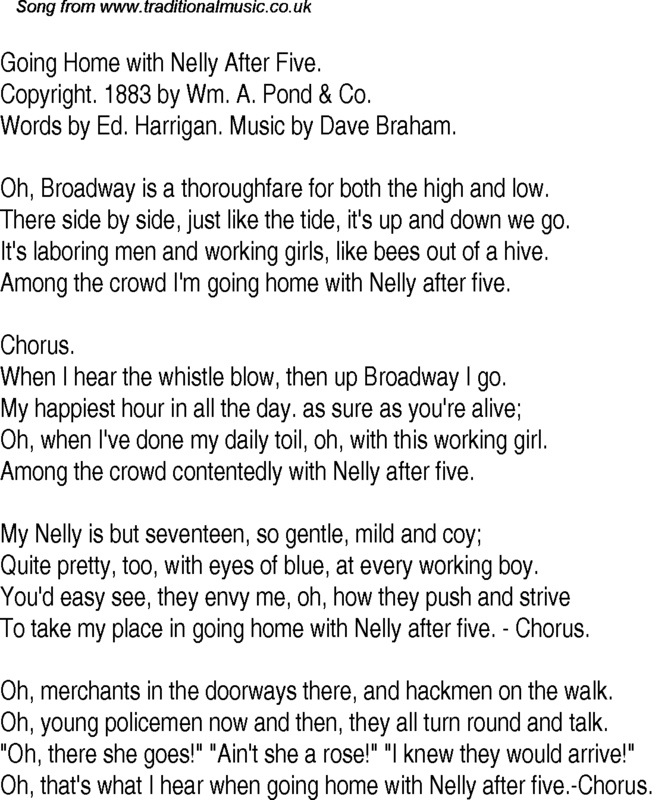 Oh, that's what I hear when going home with Nelly after five.-Chorus.